It seems the latest news about the ongoing healthcare reform with the American Health Care Act (AHCA) is stalled in the Senate for the moment. So, we will take a reprieve for a couple weeks and return to June’s lifeskill, Housekeeping. We will pick up on health and wellness again next month since July’s lifeskill is Wellness, with the focus on how to work wellness around whatever “system” is put in place. I know . . . Who wants to even think about housecleaning in this Texas summer heat anyway! No worries. Relax, sip on that chilled lemonade, and take your minds off the weightier life challenges to contemplate those “ooey, gooey places” we all love to clean, right?! What “ooey, gooey places” do you have in your home? Like most of us, we would much rather simply ignore them, reassuring ourselves with “No big deal, no one can see them.” Yet, those places won’t let you forget their look, smell, and gooey signals that eventually show up. Here is my ooey-gooey confession. One is the black yuck that accumulates in the kitchen and bathroom sink holes. I have nicknamed them “the black holes of housecleaning!” Sure, I routinely clean the surfaces of the faucets and top part of the sink stoppers. But do I routinely pull the stoppers out to discover the black covered ooey-gooey residue accumulating? Not really. Fortunately, I do not have a keen sense of smell. Yet, my husband can smell something from miles away, let alone the sink before him! So, out of compassion for his olfactory prowess, I pull out the old toothbrush converted to sink crevice scrubber, and clean away the offending substances. I even scrub down into the sink hole . . . am I proud or what! Do I then daily check the kitchen sink strainers to inspect and clean away the grime and goo, particularly between the gaskets? Not really. But I do clean the strainers every few days since my husband is the cook most of the time, and I am the cleaner-upper most of the time. One has to pick up the strainer to send the garbage down the disposal and find the gooey residue somewhat disgusting! So, out comes the kitchen scrubbers and cleaners! 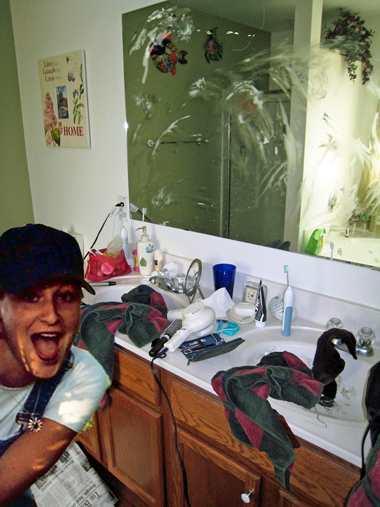 Being forced to clean these ooey-gooey places actually inspires me to do a more thorough job with the sink itself, including around the sink caulk that needs replacing ever once in awhile. It too contributes to the ever mounting black holes of housecleaning! By now, you may be wondering, “Who would ever want to come to her house! ?” Yet, let’s get real here. How about you going to your kitchen sink and check your strainer right now? Even pull up your bathroom sink stopper and see what lurks there. Except for those ever disciplined “Cleanies” out there who never let a day go by without a clean sweep of those ooey-gooey places, us more relaxed “Cleanies” and even recovering “Messies” still try to keep up with those ooey-gooey places and “black holes” at least weekly, if not every three or four days. So, I think we are all doing just fine. I am also gratified by those who do visit our home and compliment us on the welcoming and neat home. It does keep me on my toes, that is for sure . . . particularly when a friend calls to come over right then! Envision us scurrying around picking things up, doing a quick dusting, sink and toilet cleaning. Do you relate dear reader?! I bet you do. When it comes to ooey-gooey places, one thing to keep in mind is the type of water pumped into your home. Whether city water, with chlorine and mineral deposits, well water, or rainwater catchment system, your home will have its own particular residue buildup. Residue will also depend on the personal care and cleaning products you use, as well as any filtering system for your home. One advantage of well water and rainwater catchment is there isn’t any serious mineral buildup in the showers and sinks like there is with city water. Also, when using a septic system, personal care and cleaning products needs to support a septic system. Now, let’s hear your story. How often do you frequent those black holes of housecleaning? Every few days, once a week, once a month, or once a year, if you remember?! What other ooey-gooey places can you think lurk in those darker places of your beautiful castle or closet? I just may have another one for you next time.